Carnegie scientists and their collaborators have discovered new properties in the magnetic material Ge2Sb2Te5 (GST) under pressure. Understanding and exploiting these unusual properties may eventually lead to new types of memory drives and computer systems that store data more quickly, last longer and allow far more capacity than current data storage technologies. 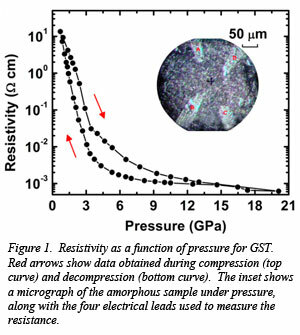 GST is known as a "phase change material" that, when exposed to heat, can undergo a transition between its amorphous and ordered crystalline states. The amorphous form of GST has a higher resistance to electric current than the crystalline state, and the two phases also reflect light differently, which allows a GST-coated surface of storage media, like a DVD, to store information and be read by miniature lasers. In addition to its improved stability compared to materials currently used in flash drives, GST has a potential response time that is 100 times faster and can be rewritten around 100,000 times. Although GST was discovered in the early 1980s and manufactured commercially in the 1990s, the precise mechanism of amorphous-crystalline transition has remained as a mystery, partly due to unusually fast kinetics, on the order of nanoseconds, when the material is heated. To address this problem Yue Meng (HPCAT), Wenge Yang (HPSynC), and Lin Wang (HPSynC), along with colleagues from Johns Hopkins University, Oak Ridge National Laboratory, George Mason University, and Beijing University of Technology used diamond anvil cell high-pressure technique to compress the material, so that a more gradual phase change is achieved. Using synchrotron x-ray diffraction and electrical resistivity measurements, along with computer simulations, the researchers were able to isolate discrete steps in the transition between the amorphous and crystalline states and understand the process at the atomic level. The primary step in the process appears to be the reduction in volume fraction of regions of low electron density in the structure from ambient pressure to 8 GPa. This correlates directly with the drop in resistivity over several orders of magnitude observed in the same pressure regime (Fig. 1). [M. Xu, Proc. Nat. Acad. Sci. 109, E1055 (2012)].